To celebrate the debut of Conan O'Brien's new 30-minute late-night show on TBS, the Pantone Color Institute has worked with Team Coco (a brand name owned by Conan O'Brien's production company) to create a unique colour that defines the legendary comedian, writer and television host. But how do you capture the essence of one of America's longest-working late-night talk show hosts – the comedic genius who has worked on Saturday Night Live, and wrote the monorail song in The Simpsons? Naturally, there's only one colour that could sum him up. Team Coco Orange is described as an "affable, warm-hearted orange tone", one that "encourages conviviality and social interaction". As you may have also noticed, it's a pretty close colour match to the comedian's famous hair as well. 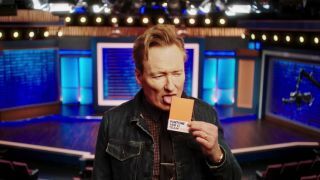 Check out how Team Coco worked with Pantone Color Institute in the video below, where Conan O'Brien explains with his typical deadpan wit the secret ingredients that went into making the distinctive orange colour (spoiler: it involves banana peel). Team Coco Orange is set to appear in artistic displays in New York up until 22 January. These displays include street art installations, buses decked out in the unmissable colour, and illuminated billboard advertisements for the new series. It will also be the foundation colour for Team Coco's branding going forward.